The first ever recorded speeding traffic ticket was committed by Walter Arnold in Great Britain in January 28, 1896. He was reported as going 8 miles per hour (mph) on a 2 mph zone. His ticket cost only 1 shilling which is worth roughly $0.26 USD back then, and about $31 USD in 2015 currency; which is still far cheaper than what you would expect to get today. In fact going 4 times the speed limit today would almost certainly get your car towed and your license revoked. 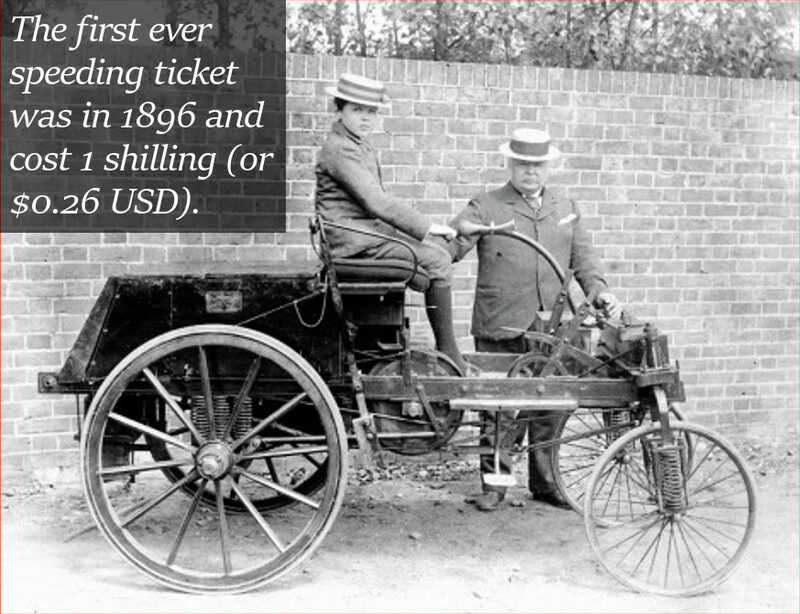 Nonetheless the 8 mph speeding ticket just goes to show you just how far we, and our cars have gone in just over 100 years! a) I used the Concertina Calculator from 2) to convert 1 shilling from 1896 to year 2000 currency which is 17.44 British Pounds. b) Then I converted this year 2000 BP to 2015 BP using our Inflation Calculator to get 23.41 BP. c) I then converted the 23.41 BP to $31.42 USD using the Google Search converter. d) Then I used our Inflation Calculator again to convert $31.42 USD in 2015 currency to 1896 currency to get $0.26 USD. Disclaimer: The exact worth of 1 shilling to current and 1896 USD is hard to get perfectly accurate because of the limited resources in inflation measurments and between switching between British Pounds and USA dollars. Nonetheless this estimation is still roughly the worth of one shilling back then.